Dear customers! The Handy Backup team updates the ever-popular Handy Backup solution to version 7.8.4. This new version has a sorted list of plug-ins, bringing a comfort for users who need to select a particular data type to back up or a particular storage to keep data copies. Other improvements include selecting active/passive FTP connections, optimized usage of Yandex.Disk cloud service and some other renewed and improved features. Instead of the single list of all plug-ins available for backing up, storing or synchronizing data, the new version brings the grouped view of different data types and storages, sorting all the collection of usable plug-ins by these categories for quick search. Now, a user who plans to operate with a particular data type (such as databases or files) and a particular storage type, e.g. cloud storages, can quickly find all he or she need just by viewing on the plug-in panel, which displays all plug-ins sorted by types. Starting from now, a user can select active or passive FTP connection when using the “FTP” feature for both backup and storing data. 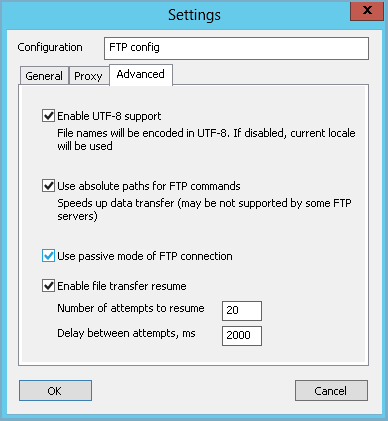 Changing between passive and active connections allows building Handy Backup into some common strategies for using FTP servers. It also brings a bit more of security options when using FTP for storing backups. 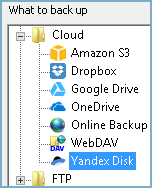 The plug-in for using the Yandex.Disk cloud service, popular in some European and Asian countries due to its stability and functionality, has some drastic improvements in internal algorithms. Now the feature bases connections with Yandex.Disk completely on this cloud’s API, making any data transaction even faster and more secure than before. The usage of this cloud service in junction with the new Handy Backup plug-in allows quick, reliable and cheap storing for any data you want.